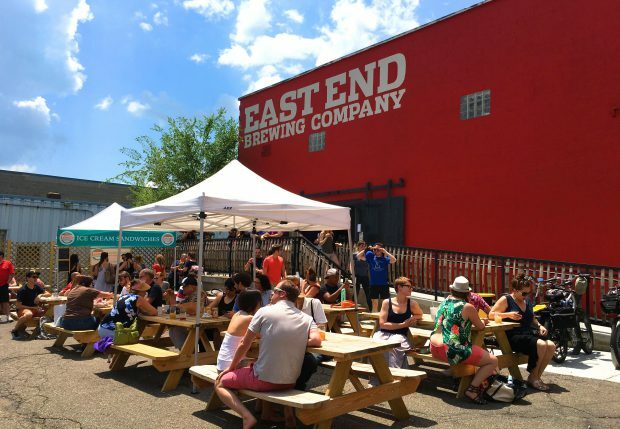 One of the best kept patio secrets in Pittsburgh, is the patio at the East End Brewing Brewery in the Larimer neighborhood. Last year they transformed the parking lot into a delightful beer garden. The East End Brewing Brewery has always been a family-friendly spot for spending an afternoon. The patio makes this a great place for everyone to spend a hot summer afternoon with a cold beer (or root beer, which they usually have on tap). Just a heads up that East End Brewing also has a location in the Strip District, the East End Brewing Taproom, so make sure to point your GPS to the East End Brewing Brewery on Julius Street if you are looking for ice cream. 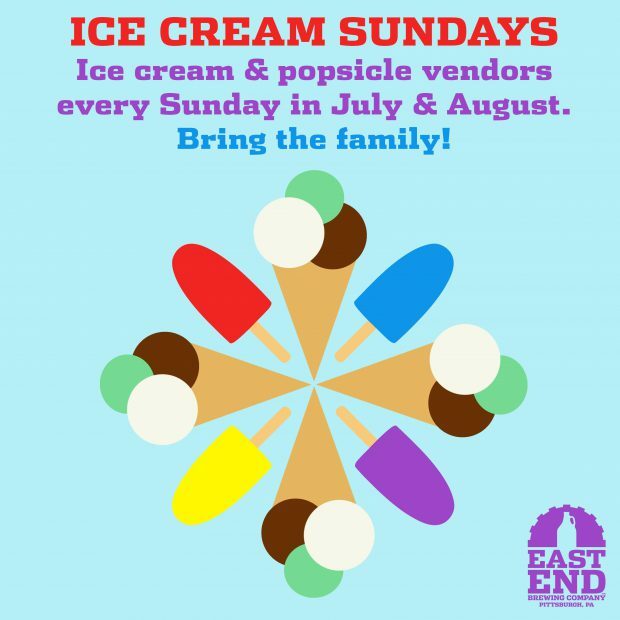 Well the good folks over at East End Brewing have come up with a way to make Sunday afternoons even better… ice cream. Starting this Sunday, July 9, there will be a different ice cream vendor at the brewery. Here is the line up of tasty frozen treat vendors…. Keep an eye out for some limited-edition beer-inspired flavors of ice cream and my sources say there may even been some beer & ice cream floats. I can’t say enough good things about East End Brewing. Scott Smith who is the owner as well as everyone who works there could not be nicer. This is by far one of my favorite businesses in town and they also make some great beers. If you have not yet had an ice cream sandwich from Leona’s Ice Cream, you are missing out. Last week I arrived at the market in Aspinwall, Feast on Brilliant, just as they were closing for the day. I was determined to pick up some Leona’s ice cream sandwiches. So I talked the poor clerk into letting me come inside to buy some ice cream sandwiches before they locked the door. Like Scott Smith, the owners of Leona’s are also incredibly nice people. Leona’s is also local, just down the street in Wilkinsburg, they have been an active participant in some of the redevelopment activities. The best way to keep up on the Ice Cream Sundays at East End Brewing and all of the other food vendors that stop by the brewery is this “Come Hungry” calendar on their website, which is also a Google calendar you can subscribe too as well. What’s that you say? You need a better way to keep track of tasty cool treat happenings? How about a twitter list of ice cream shops in Pittsburgh! You can find that list right here. « The Ladies’ GAR Home in Swissvale: How would you repurpose this building with a Civil War history?